In the snowy Boston weather as we snuggle up with families at home, the perfect compliment to the storm is a good cup of hot chocolate. I am talking about real hot chocolate, not hot cocoa. 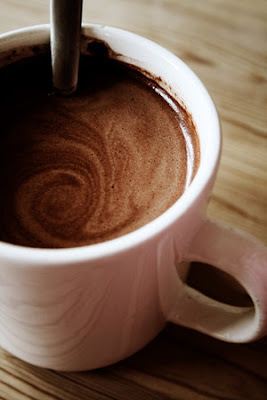 After some trial and error I came up with my perfect recipe for some real European style hot chocolate. I prefer to use Trader Joe's pound plus dark chocolate for this purpose (or substitute with some organic dark chocolate). Just heat up some organic milk (preferably whole) on medium high, never leave milk unattended! Before it boils add chocolate in small chunks until you reach the consistency you want. I usually mix 3 cups of milk with about 1/3 pound of chocolate. Stirring constantly is key. Just two ingredients, nice and simple - the kids can help. Sprinkle some cinnamon on top for the finishing touch!